Owning a puppy is a great responsibility. It is important to be consistent. If you do not have the time it takes to train a puppy, it may be best to buy an older, already trained dog. As long as you have the patience to stick it through in the beginning, you will be rewarded with a well-disciplined dog. When training your puppy, feed it dry dog food so its stools are more solid. This will make cleaning up its messes easier in case of an accident. It will need to drink more water than it would with a wet diet. Feed your puppy at the same time every day. Puppies will want to do their business soon after they have eaten, so schedule meals when you know you have the time to take your puppy outside soon after. 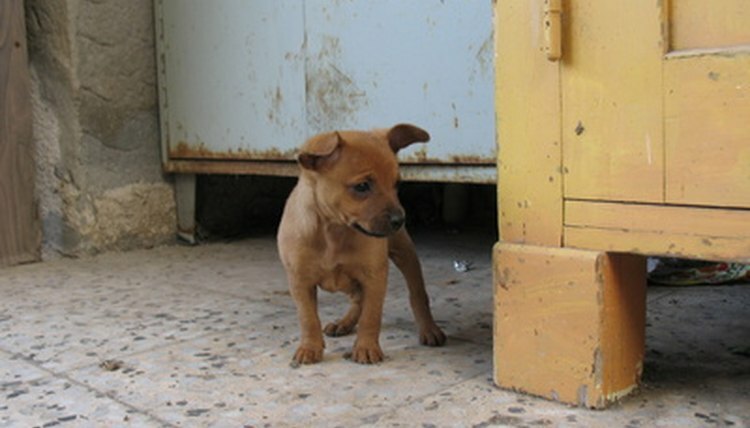 Puppies will pee or poop 15-20 minutes after they have eaten. Do not feed your puppy within four hours of bedtime or give it water within two hours prior to going to bed. During training, confine your puppy to a tiled area to make cleaning up messes easier. Your puppy will not like to be confined for long periods of time, so take it out every few hours to play. Take your puppy outside on a leash to the place you want it to potty. Allow your puppy to do its business without interruption. It may not finish the first time, so give it a few minutes after it has pooped to try again. Once it has finished, you can play with it. Never yell at a puppy for making a mess. Simply tell it, “No” in a firm voice. Puppies do not intentionally make messes just to upset you and they have no idea what you are saying. It is better to reward your puppy with a treat or playtime when it goes where it is supposed to. Potty Training Your Puppy. (2010). Family Education. Melissa Villasenor is a freelance writer with a Bachelor of Science in business administration. Since 2008, she has been covering a variety of business-related topics, including accounting, finance, economics, business law, computer technology and marketing.